Karen Silver Bloom - "Anyone for milk and cookies?" "Anyone for milk and cookies?" Vintage milk caps and cookie cutters border this yellow, red and green kitchen. 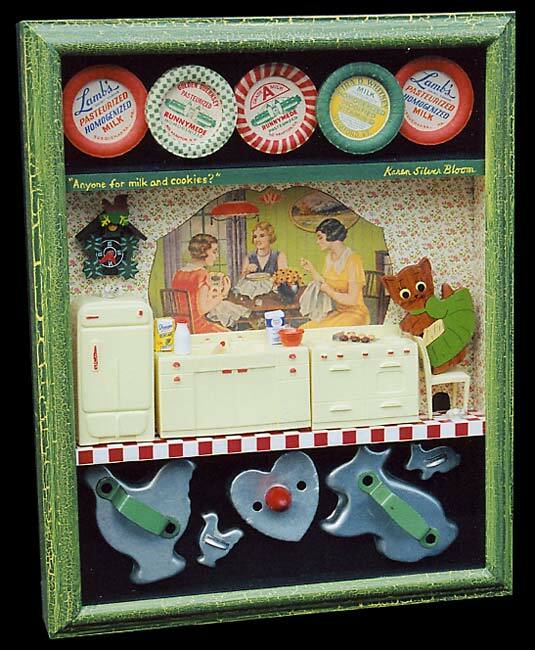 The old needle case features women sewing and talking while the cat is peeking over the stove to get a closer look at what's come out of the oven. The shadow box is finished with a green and yellow crackle finish, and the back of the box is covered with fabric from an old flour sack.